Hobart Trail’s new gravel parking lot and planned restroom facilities will prevent degradation of the environment from the numbers of cars and visitors. The Pacific Crest Trail was re-routed around the parking lot. 2015 TPD photo. Zach Million, Monument Outdoor Recreation Planner for the BLM Medford office is passionate about making the Cascade Siskiyou National Monument accessible to the public. From upgraded trails, parking and restroom facilities, to a centralized reservation system for the Hyatt Lake Recreation, Zach’s planning has improved the user experience, from aesthetics and ease to health and safety—all to conserve the Monument’s natural environment and biodiversity. “I want people to see and hike the trails we have in the Monument. When they call to report concerns about conditions--that means they care and take ownership for our public lands. Caring for the monument is a big job, and I need everyone to help me know how it’s going out there,” he said. At the Pilot Rock Trail, he worked with the Siskiyou Mountain Club and the Jackson County Job Council to reroute the trail from the Pacific Crest Trail to the base of Pilot Rock. 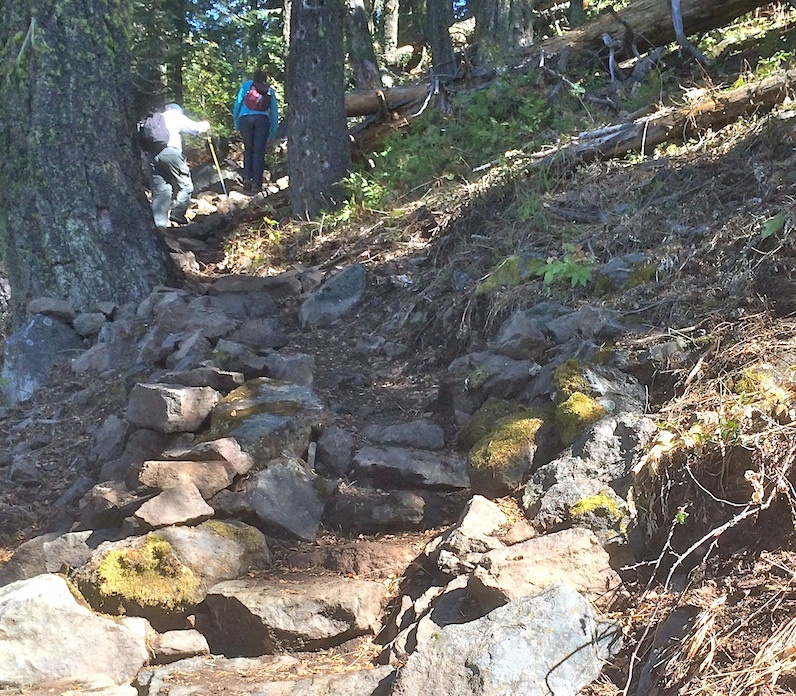 An old logging road from the parking lot to the Pacific Crest Trail (PCT) was transformed into a walking trail. A BLM sign states "improvements reduce damage, improve visitor safety and protect the wilderness values." The Bean Cabin area was re-wilded by taking out an old cistern that collected naturally flowing spring water. The spring water now feeds directly into a nearby creek, which is still available for PCT hikers to replenish their fresh water supply. Zach integrated Hyatt Lake’s Recreation Area with the online or central phone call reservation system, much like other BLM campsites—one that international visitors can easily use. We thank Zach for his work that we now enjoy during our 15th anniversary year of our Monument. He will be nearby as he transitions within BLM Medford to work with environmental and trail groups in the Applegate Valley area. Next time you hike the trails, check out these improvements at the Monument that make the place safer and better protect the land. Help care for the Monument by practicing Leave No Trace. We need everyone's help to care for the Monument.